A Southern Grace: beau who? Like most people, I enjoy getting free stuff. So when I was contacted by Challenge Dairy and invited to participate in an event bringing attention to their wonderful butter, I jumped at the chance. I hadn't heard of the company before since it's based in California, but I'm here to tell you that we East Coasters have been missing out! For this challenge, a plethora of food bloggers were divided up into groups and assigned a course--appetizer, entrée, side dish, and dessert. As someone who rarely, if ever, gets or eats appetizers, that's naturally the group into which I was placed. What's more, we were sent several spices from Spice Islands to use in the dish we'd be creating, and I received one I know intimately, one I’ve heard of but never used, and one I'd never even seen (Beau Monde? What's that? In addition to being yet another example of my sheltered nature, it's also a mixture of allspice, bay leaf, celery seed, cinnamon, cloves, mace, nutmeg, black and white pepper. Just so you know.)! So yes, this was indeed a challenge. I turned to the potato, a tuber that has never failed me. I thought it'd make an adequate, nay, excellent palette for these unfamiliar herbs and spices, and also for the butter (of course). In hindsight, I realize that the traditional preparation of these pre-meal noshes is to cut them into wedges, but I went the diced route. So the silverware might have to come out early--it's not the end of the world! To add decadence to deliciousness (and since a fork was required anyway), I drizzled a bit of my truffle oil over the seasoned and roasted taters. 'Twas a fine touch indeed. And in case you're wondering, Beau Monde seasoning is wonderful--it's just a random and complex blend of some great herbs and spices. Try it out! Preheat oven to 450°F. Line a 15x10x1-inch baking pan with foil. Place the cut potatoes in large bowl. Add melted butter and toss to coat well. In a little bowl, combine the Beau Monde seasoning, fennel seed, ground chipotle chile, salt, and pepper. Sprinkle this blend over the potatoes and toss to coat evenly. Arrange the seasoned potatoes in a single layer on the prepared pan. Bake for 30 minutes or until potatoes are tender and golden brown. Add more salt and pepper as needed and drizzle with the truffle oil before serving. If you want to be entered for a chance to win one of five $100 gift cards, all you have to do is write a post about the sweepstakes that Challenge Dairy is running. The winner of this sweepstakes wins a pretty spectacular getaway, which you can read about here. Wow, as a tater loving girl, that sounds delish! Truffle oil? dang girl! Cool! It's always interesting to realize something I see regularly in my fridge isn't known elsewhere. Challenge butter is what I routinely buy and it never fails me. I haven't used it on roasted taters, though. Sounds heavenly -- especially w/the truffle oil. Yum,roasted tators are hard to resist anyway...I'd just eat the whole pan of these tasty tators! I'd say you did good, Grace! Grace, you are a wizard at bringing just the right touch to a simple ingredient. I like to use Beau Monte in various pork recipes, because it puts a terrific twist; much like I would think here on your "taters". These look so good. The Beau Monte is new to me ,too. Will have to try these if I can find the truffle oil. I am sure I will have to go to the city. Thanks. YES! To the free stuff and the truffled potatoes! I think the diced route worked out just fine! I love when surprising dishes come together! This sounds great...I mean, potatoes and truffle butter? What could be wrong about that?! Wow, I never knew a potato could be made with so much decadence! Anything with potatoes! Beau Monde was big around here in the seventies, I haven't seen it used much lately, maybe its time again. Okay - can I tell you I grinned when I read the word "plethora?" It's my all-time favorite word and I work it into conversation whenever possible. You go, Grace! BTW - kudos on the spuds! Mmmm, love me some taters and seasoned, buttered, and truffled only makes them better! I've actually used beau monde seasoning before! I had to think about why that sounded familiar, but then remembered my sister always puts it in her dill dip. Great looking potatoes! These look like some mighty tasty taters. I love that first picture...I wish I could reach in and pick up that fork to try this! yup, you knocked it out of the ball park this time. I got some no name butter because it was on sale - don't think I'll be doing that again. Lesson learned - don't skimp on good butter. fennel? ok good, I am loving that. and you just told me a week ago that you are not that creative! umm hello? I love freebies too! Love the idea of adding fennel seeds. most yummy-looking potatoes I've ever seen! I have never seen Beau Monde used in anything but a dill dip that I've been making for ages. I've got to try this! What a rich and indulgent dish with all that delicious butter! Love it! Grace, yum! You've outdone yourself here. Beau monde? Cant' get it here...but thanks to you I can whip some up. Taters? It's not dinner without them! Not only do you do a great job with dessert, you really nailed the apps too! Truffle oil is a great touch indeed! You can never go wrong with taters. I'd eat these as appetizers, but they look like a fine side dish, too. Free stuff is always good. And potatoes roaste4d with lots of spices are always a winner. So this looks like a win all the way around! Beau Monde? Never heard of it. Sounds like an interesting mixture of spices. Potatoes are a great idea as a vehicle for carrying spices! And butter too of course. One can't forget the butter! 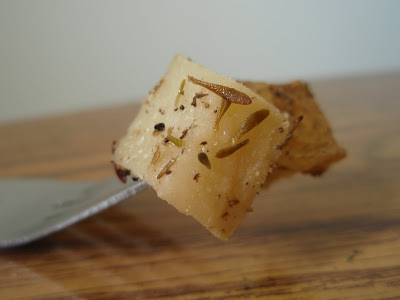 I think these potatoes look and sound fantastic - I love the addition of fennel seed. Mmmm good. Love Challenge Butter. It's the only butter I use. This recipe looks wonderful. Thanks for sharing. mmm those potatoes look delightful! do you think i would like truffle oil even though i don't like mushrooms? These tubers tout tremendous taste! Like it? I do. I have heard of beau monde. Only for a dip that use to be pretty popular. A bread bowl kinda dip. But other than that... who knew? Now I know I can sprinkle it on my spuds! I have never heard of beau monde before, I dont like mushrooms so I am not sure if I would like the truffle oil. Wow, those sounds beyond divine! beau monde seems like an appropriate name for such a fabulous mix of spices- beautiful world indeed! now... your potatoes look fabulous- my mom makes something like this that is one of my favorite things in the world! Psst - don't think I've heard of Beau MOnde either, thanks for enlightening me! Those taters look absolutely amazing. Oh yum! 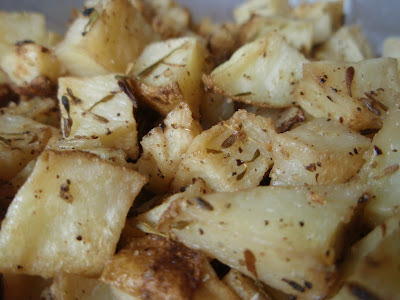 Yum, these potatoes sound so good with truffle oil and Beau Monde spice mix, excellent! Truffle oil you say?! Those are the best looking tots I've ever seen!